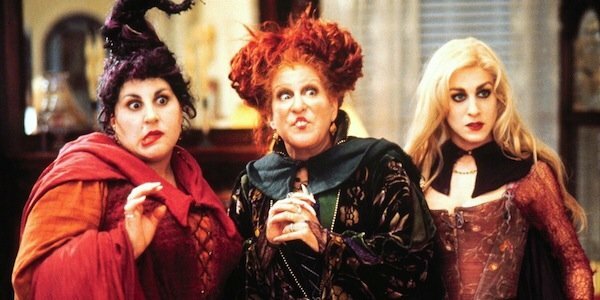 Hollywood and moviegoers everywhere stood up and took notice when it was speculated that Tina Fey was working on a Hocus Pocus remake with Disney. It was later suggested that, rather than being a remake, the writer and actress was actually developing an untitled original Witch project with the studio. Tina Fey has now partly clarified the film’s status, providing fans with a succinct update. There’s a script in development. It’s not so much a remake. After making the above remarks, Tina Fey then gestured to say that she should probably keep her mouth shut as there was no conrete information on the film, which is still clearly in development over at the studio. That is fine, as long as it means that Tina Fey and her Disney counterparts are fine-tuning her bewitching potential film, rather than being at creative odds over it. Because if we somehow don’t get a Tina Fey witches movie, it doesn’t even have to be a Hocus Pocus remake, then Hollywood has failed massively. Released back in 1993, Hocus Pocus was only a minor success, grossing just $39.5 million from a $28 million budget. However, since then, it has become a permanent fixture on TVs around Halloween, developing a cult status amongst film fans. After Tina Fey made her above comments, Damian Holbrook asked, "Is it just because it’s witches it’s a Hocus Pocus remake?" Fey either seamlessly overlooked the question or didn’t hear it, but that didn’t stop her comically adding, "I saw this article with Meryl Streep where she said that when she hit 40 or something all that she kept being offered was witches. She was like, ‘Screw you!’ Which she rejected until she played the Witch in Into The Woods. Which is an amazing role. But it’s funny because like you go from ingénue, ingénue, working gal, witch!?" Speaking of Into The Woods and Tina Fey, during the same discussion the 30 Rock and Unbreakable Kimmy Schmidt creator also told a truly hilarious story about how she tried to cram her way into Rob Marshall’s fantasy musical. Which ended disastrously for her. Now let’s just start praying to the heavens that the same doesn’t happen with Tina Fey’s potential witches film.